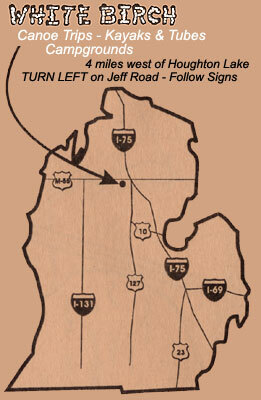 TURN LEFT (South), and follow signs. 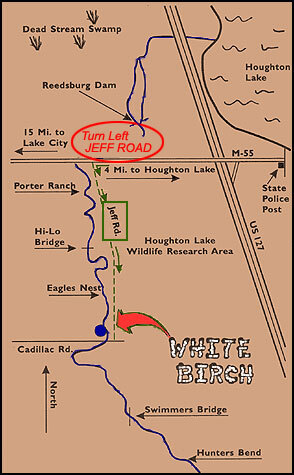 Welcome to White Birch Canoe Trips and Campground, where you can canoe the fun and scenic Muskegon River in northern lower Michigan, located four miles west of Houghton Lake. The MUSKEGON RIVER down stream from Houghton Lake is one of Michigan's unsung river gems. Flowing through unspoiled state lands, the river offers great canoeing, kayaking, and tubing. 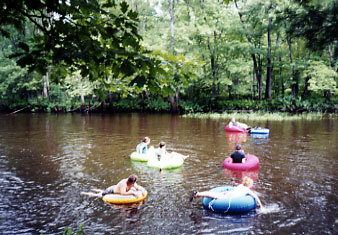 Warm shallow (1'-3') water with a sandy bottom makes the upper Muskegan great fun for everyone. Bob and Pat's WHITE BIRCH CANOE - CAMP is where the ''ADVENTURE'' begins. Our campground is clean and spacious with lots of trees and grass. We have large group areas where you can set up together and also a few water front sites.Bob and Pat's legendary White Birch Canoe Camp has served paddlers and campers for over 30 years. Owned and operated by Bob and Pat Holt.